Ocean Interactive's 2D-platformer adaptation of H.G. Well's novel is confident in visual design only. Since the developer couldn't make a sequel to its DSi title Dark Void Zero, it turned to Paramount's film vault and dug for their next project. After fighting for a Barbarella adaptation, the developer settled on its second choice: A recreation of H.G. Well's seminal novel War of the Worlds. One look at the game and it's immediately apparent that Ocean Interactive is inspired by the 1953 film adaptation, rather than Steven Spielberg's 2005 modern recreation. The game loosely follows the story and events of the 1953 film, but focuses on a new cast and story. 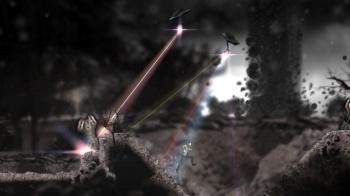 The demo takes place during a London alien invasion, in which the protagonist must hide in the shadows as alien ships annihilate soldiers in the open. The game has a distinct black & white art direction that will draw immediate comparisons to Limbo. Both games are inspired by classic B&W films: Limbo took inspiration from expressionist films of the 30s, while Ocean Interactive looked toward Hollywood films of the 50s'(War of the Worlds being one of them). Flashes of explosions fill scrolling parallax layers, while waves of fog block sections of the battlefield from time-to-time. The lighting effects are impressive, especially in one scene where the player must climb a large alien machine while a blinding glare sporadically whites-out the screen. The game uses color exclusively for enemy fire and the main character, which helps keep the player's eye on the action. The animation and characters, however, don't look quite as good as the backdrop. Despite rotoscoping actors for the animation, characters have an odd look to them that doesn't have that Flashback detail or charm. Even the elements of the game that look good are endlessly repeated throughout the demo, making for a mundane presentation despite its ten minute running time. The audio was equally dull and monotonous, putting me into sleep-state. Patrick Stewart's soothing voice over narration didn't help matters, even if it is a good performance. The demo presented two main actions: climbing and waiting. If that sounds incredibly limiting and boring...well, yeah. In disbelief, I sat and watched the demo's driver move a couple feet forward in the game world and wait behind a tank, over and over and over. The idea is that you are hiding from the aliens in the shadows, running when they aren't looking and rolling across the ground when temporarily caught in an alien's spotlights. Eventually, the player arrived at a giant alien machine he had to climb while evading moving laser. If my heart rate ever got racing during the demo, it was due to anticipation of what I would see later that day. Evading aliens only makes sense for a War of the Worlds game but Ocean Interactive's take on the material holds none of the urgency you'd want. Instead, it is a stealth game where all options are binary and painfully dull. The developer said the player would gain weapons near the end of the game, but it wouldn't suddenly turn into Contra. I don't doubt that Ocean Interactive are pouring their heart into this project. The developer has their head in the right place conceptually , but in execution the game seems sluggish, unpolished and not the least bit fun or original. In its current state, it looks like an iPad game you'd pick up and dismiss after spending a couple minutes with it. We'll have to wait and see if War of the Worlds has more to offer than rolling, climbing and waiting behind tanks, when it hits Xbox Live Arcade and PlayStation Network later this summer.